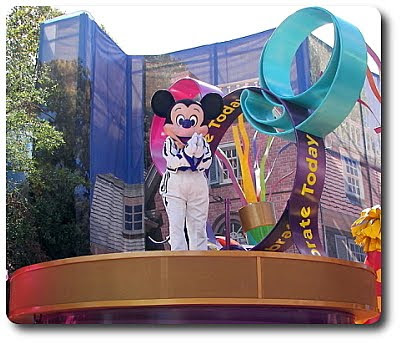 Yes, we've been in Disney World as I took Jeff there in celebration of his birthday (and this should surprise no one!). I had some posts scheduled to go up while we were gone, but apparently something went awry and none of them happened. I'm sorry about that. We are doing fine (though tired!) - thank you for all of the notes wondering what happened! We flew back last night, but it was a long flight with delays and we caught a cold on the last day in Orlando... so we were pretty zonked out by the time we finally walked through the door. I'll need a day or two to get caught up and back on track, but we'll let you know how the trip went and get back to posting as normal then! Before we get to tonight's dish, I have to tell you about what we picked up at the market yesterday. 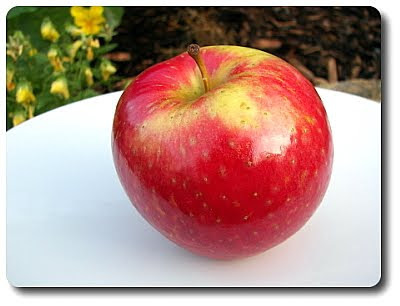 I knew this item was coming out this year and have been eagerly waiting to catch it - the new SweeTango Apple! This comes from the same group that brought us the infamous Honeycrisp and this apple, in fact, is a cross between the Honeycrisp and Zestar apples. Here's my thought process as I ate through my first apple - "Woo! This just might beat Honeycrisp in the crispy department - now wait a second... dang, this is so sweet too!". Then, I wiped my chin as juice was dribbling down, my next mouthful led me to a fascinating tangy finish that was not quite as powerful as a Granny Smith pucker, but still had some pull. I haven't tried baking with it yet, but I'll be interested to see how it holds up to heat - it might make for one sweet apple pie! There is one downside... as they are so new and limited, the apples were darn pricey - three medium-sized ones were just over $5. Okay, time to move on! Tonight's dinner was definitely one of the more fun recipes we've made in awhile! 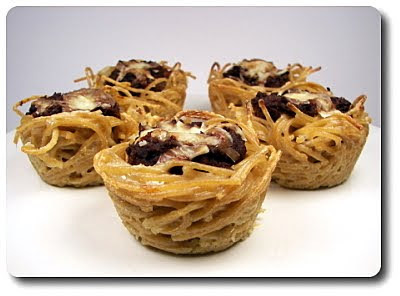 Think Sloppy Joes and spaghetti, except made in a form that could be picked up with your hands and eaten more like a muffin... yup, that would be Sloppy Joe Spaghetti Cups! After starting with lean ground sirloin, cooked with chopped onion until the beef was cooked through and had turned into crumbles, we then started layering in flavor by tossing in a couple minced cloves of garlic. One quick note on the meat - using the sirloin, there wasn't much extra fat that needed to be drained away. If you use ground beef with more than 10% fat, you'll need to drain away the excess grease before you add the garlic. Also, this would work just fine with ground chicken, turkey or even soy crumbles if you fancy them. Stirring the meat mixture around until the garlic was fragrant, Worcestershire sauce, cumin, chili powder, smoked paprika were the next ingredients added to spice up what will become the filling. Dollops of tomato paste are also added now... which brings us to my tomato paste plead. In dishes like this, or when you're using paste in other soups and stews, let the tomato paste hang out in the pan for a minute or two before you start adding liquids. The heat will start to caramelize the paste, adding character by developing the more subtle nuances. The filling then comes together when a cup of water is added and is left to simmer and concentrate down. While that was happening, we had a half pound of whole-wheat spaghetti, that I snapped in half, cooking away in its salty bath. 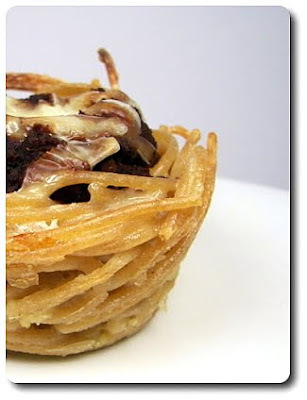 Breaking the strands in two will make it easier to fit them into the muffin cups shortly! To cool the pasta down quickly and stop it from continuing to cook, it was rinsed with cold water, then drained well. To get that pasta to bind together enough to hold the cup form, we tossed it with a mixture of sour cream, an egg and a bit of sharp white cheddar. 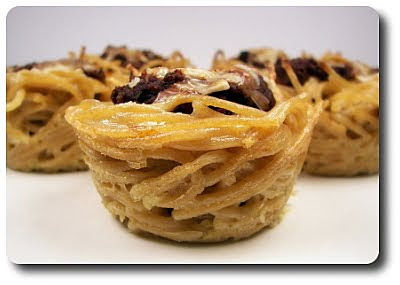 Taking a small pile of the coated pasta, we placed it in one of the open wells of a muffin tin and used a spoon to compact it in. A small portion of the thickened Sloppy Joe filling was then scooped into the center of each pasta-filled well, followed by another dose of the cheddar. Once all the wells were filled, the pan was placed into the oven to bake until the cups had warmed through and firmed up. The original recipe was decidedly different in the seasoning section - it didn't have fresh onions, garlic or Worcestershire sauce and just added a purchased Sloppy Joe mix. As you can see, we didn't go for that, but kept the theme in mind - however, if you have mouths to feed that like food on the plain side, I can see why one may want to go in that direction. Using the nuttier whole-wheat spaghetti adds plenty of nutrition, but it would of course be fine using regular - saying that, because of the way this is put together, I bet one could sneak this by if you don't regularly use whole-wheat. 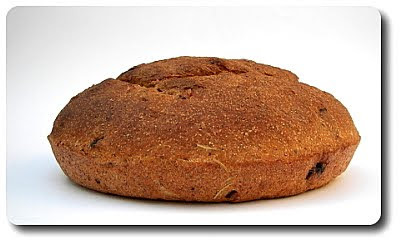 You could even use half whole-wheat and half white if you'd like to slowly start working it in. If you have small helpers around, you could definitely get them involved with making these snazzy pasta cups - hand them a cookie scoop and let them fill up with the meaty sauce or give them the honor of being the Official Cheese Sprinkler and have them add a few shreds on top of each one! Besides apples, the next sweet ingredient that pops into my mind when fall time comes around is always pure maple syrup! Our pantry is never without a bottle of that rich, sticky syrup - besides its everyday use on pancakes, we use it in several different recipes like bread, cake, a wicked peanut brittle, and the syrup has even made it's way into savory dishes like those pork medallions and spiced tenderloin. Since we're posting this on a Tuesday, I bet you can guess where we used it this time... you got it, the Weekly Wednesday Treat Day! 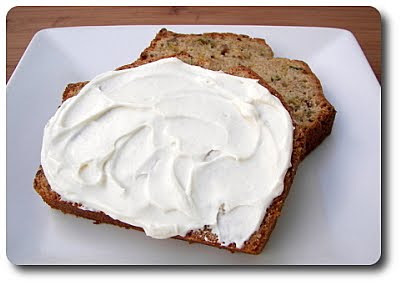 Maple syrup even plays two roles in this Zucchini Maple Bread with Cream Cheese Maple Butter we made - once in the bread and the other in a decadent spread! While we didn't plant any zucchini this year, we had no problems finding a friend who was wanting to get rid of bunch - no surprise there! 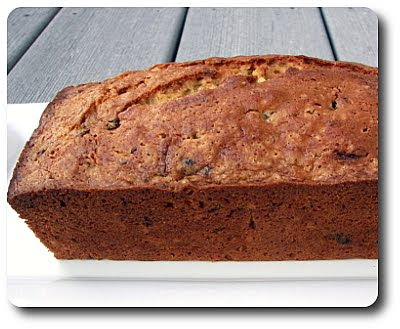 Using the classic quick-bread method, the batter for this bread came together quickly with little mess as you just need pouring the wet ingredients into the dry and stir to combine - no creaming involved. You can even make this a one-bowl batter if you like to reduce clean up by making a well in the center of the flour mixture, pouring in the wet and then mixing the liquids together as you pull the flour in from the side. Out of habit, I just do the two separately and then marry them together - works great either way! While brown sugar is used for structure and to sweeten, a couple glugs from our jar of maple syrup adds another depth of sweetness, yet won't make the bread seem like candy. 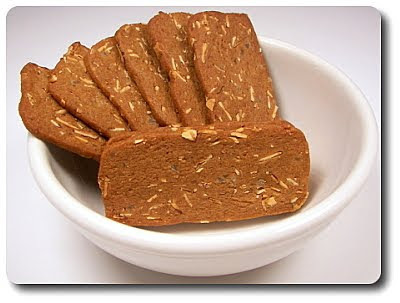 Using a generous amount of shredded zucchini, the loaves were also spiced up with fragrant ground ginger. I say "loaves" because while the recipe is written for one loaf, I made double the recipe and split it between two pans. To accommodate different tastes at Jeff's office, we thought we would try one of each optional add-ins (being chopped toasted walnuts and chopped dates) in separate loaves. Feel free to add both of them into one loaf or just skip them entirely if you don't like either - we found this bread to be pretty open to interpretation! While the batter was in the oven baking away, I had cleaned out the mixing bowl to start on the maple butter we were going to have in a separate crock on the side to serve with these. Using softened cream cheese and butter (can't go wrong there! ), we dosed the two with more maple syrup and just a touch of brown sugar. You can do this with a wooden spoon, but to whip in plenty of air to give this a light and fluffy texture, I pulled out our mixer and let it go to town. My plan is to hold this in the refrigerator overnight, but will make sure it sits out for a bit to take the chill off before he brings it in. With all the moisture added from the zucchini, the loaves do take awhile to bake - it was over an hour before they released a wooden skewer that was mostly clean. You don't want any wet batter on the skewer, just a couple moist crumbs that cling! Give them just a few minutes to set up in the pan before turning them out - just like muffins, quick breads can sometimes get a tough crust if left to steam in the pan while cooling down. I'll be slicing these in the morning to arrange them on the tray Jeff uses to carry them in, but I did take off a few pieces tonight from each version we made - for pictures and of course, quality control, as Jeff calls it! 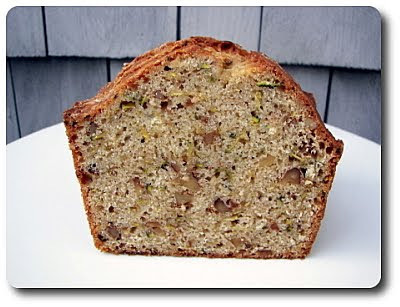 The bread with the walnuts was Jeff's favorite - the little crunchy nuggets in the bread fit in well with the maple and zucchini; just be sure to toast them first so they have more stage presence and don't fall away into the background! I think I preferred the date version just for the fact you don't see them used that much in breads like this anymore - the pockets they dotted the slices with gave off a unique sweetness that grabbed my attention and didn't let me forget. Both of us thought they would make a killer bread when all combined into one loaf though, especially with a dollop (or two...) of that creamy maple concoction spread over! Every so often I'll come across a unique looking recipe (at least to us) and stash it in my "to-try" stacks with the hope I'll be ambitious enough to try it. I usually end up passing them by quickly though when I'm trying to pick out recipes for the week... but this time I made sure to pick out at least one to make. 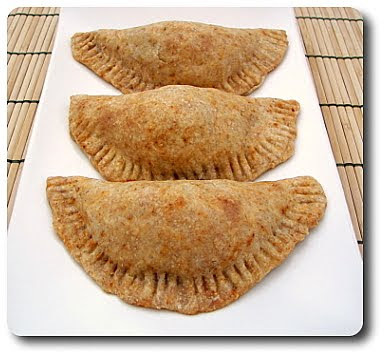 That's how these Banana and Black Bean Empanadas ended up on our table for dinner tonight! To wrap around the filling, we had to get the pastry together to use as the crust. Using a combination of all-purpose flour and whole-wheat flour, spiked with chili powder to add a note of spice, I used my fingers to work in a few cubes of cold butter. A pastry blender or a couple knives would work, but since it was just a few tablespoons, my fingers took care of the job quickly. 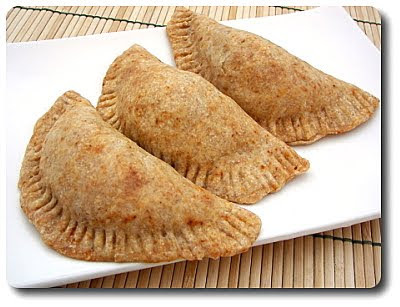 To bring the dry ingredients together, applesauce and a splash of vinegar were stirred in to moisten and form the dough. Keep a small bowl of icy water handy when you do this - if the dough appears to be crumbly or dry, add sprinkles of the water until it holds together. To settle the gluten down, allow the flour to finish absorbing the moisture and firm the butter back up, the dough now needs to chill out in the refrigerator for at least an hour - if you're ambitious enough, feel free to make this the day before to get this part out of the way. While that rested, the most intriguing part of the recipe came into play - black beans and bananas! I realized this isn't a new combination to some, but to us it is... we would have never thought to put these two together. After softening a handful of onions, black beans and minced garlic were tossed in and brought up to temperature. Diced bananas were then tossed in (at this point, Jeff left the room as he really couldn't believe I did that) and the mixture was seasoned with smoky cumin, cayenne pepper and a dash of ground coriander. To preserve texture, once the bananas go in, the skillet doesn't stay over the heat for too long - just enough to lightly toast the spices and begin to break down the bananas. Off heat, the filling was freshened up with a sprinkling of fresh cilantro and given a controlled dose of heat with a shot or two of cayenne pepper sauce. You do want to set this aside and let it come to room temperature before you begin filling the pastry - if you added it warm, it would heat the butter in the pastry up and become fairly difficult to work with. To not waste any of the crust with leftover scraps, instead of rolling the whole shebang out and cutting it out into rounds, we divvied the disc of dough into twelve pieces (this is when having a kitchen scale comes in handy! ), then rolled out each into circles. Do this all at the same time, then keep the circles in stacks with parchment or wax paper in between them so you can breeze through the assembly. Filled and sealed into half-circles, for one more layer of insurance to keep the bean-y mixture inside, use a fork to crimp the edges of each together. What a nifty little pocket meal! The sweetness of the banana didn't strike me as pushy as I thought and with the spice in the filling and crust, it worked to balance the dish well. While empanadas are often fried, these were baked and rank pretty high on the health meter - however, they didn't taste like they should be! You may not get an exceptionally flaky crust with the combination of butter and applesauce in the pastry (that wasn't my change, it was how the recipe was written), but the texture was still acceptable. 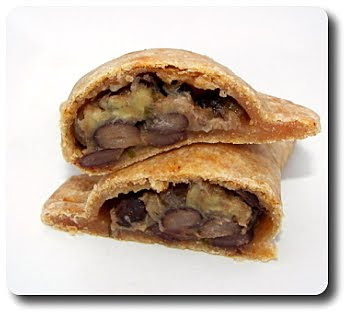 Vegetarian as is, you could easily turn this vegan if need be - change out the butter in the pastry for a soy margarine or use a product like those Earth Balance buttery sticks. It had been way too long since I put my hands to work kneading a stretchy ball of bread dough, so even though it was the weekend, I set the alarm last night so I'd get an early start on this Raisin-Rosemary Rye Bread I made today. Besides being attracted to the rye (I have a bunch in the freezer I need to make a dent in! 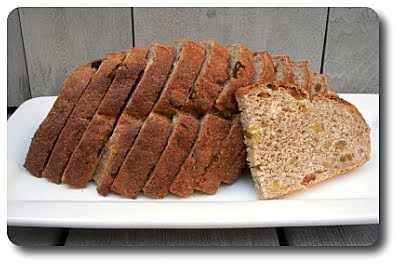 ), what I liked about this recipe when I was picking through my choices was how it used a variety of dry ingredients - sturdy bread flour, whole-wheat flour, the rye flour and for a bit of texture, cornmeal! Mixing those together with instant yeast, sugar, nonfat dry milk, salt and freshly ground black pepper (that may seem odd, but don't leave it out! ), the dough was formed by mixing in plenty of warmed water mixed with a few drops of olive oil. I use instant yeast (kept in the freezer to extend freshness) just for the fact it doesn't need to be proofed first. If you'd rather use active-dry, use the same amount called for (which is conveniently the same amount that comes in one of those handy packets), but instead of mixing the yeast with the dry ingredients, dissolve it into the water, along with the sugar called for, and let it stand for 5 to 10 minutes. Because you'll be holding back on some of the bread flour, the dough will be on the stickier side right away - this is exactly what you want because it is much easier to add more flour if needed, than to try and knead in water. Add enough extra flour to keep the dough from sticking to your fingers, but not enough to make it dry - it should feel just tacky to the touch and feel like it wants to grip your work surface. Once the dough is elastic and supple, the time has come to work in the fun ingredients - toasted walnuts, raisins and just because Jeff loves it in rye bread, a pinch of caraway seed. The dough now needed to rise - depending on the temperature in your house, it should take about an hour to double in bulk. If your house is exceptionally cool, keep in mind that it may take longer. You could speed up the process by placing the covered dough into an oven (left turned off!) with the oven light lit to raise the temperature enough - however, with a slower rise, more flavor is allowed to develop! Instead of shaping this into a loaf, after letting some of the air out from the risen dough, we re-shaped the ball into a tight round and set it into a pie plate to rise once more. This time it should rise a bit faster, usually 15 minutes, depending on how active the yeast has gotten. During this time, make sure you get the oven on to give it plenty of time to come up to temperature - you want a very warm, even heat for bread! Just before placing the dough into the oven, to give it room to grow, a sharp knife is used to make a few slashes on top - you can do a large X or a few parallel lines, but we tried a diamond shape (which I apparently still need to work on... hee hee!). You can take the temperature of the bread to check for doneness if you like (it should read around 190 to 200 degrees), or just use your hand to tap on the bottom - you should hear a hollow thump. 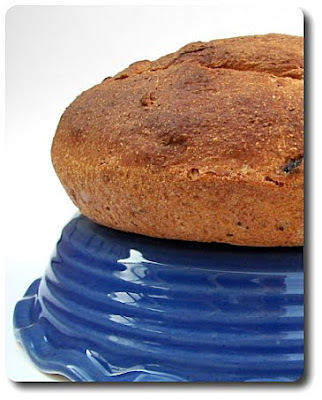 As with most breads, for the best texture (and yes, I know just how hard it is to resist warm, fresh baked bread!) you should really let it rest and cool for at least an hour before slicing into it. I don't always follow this, but I try! 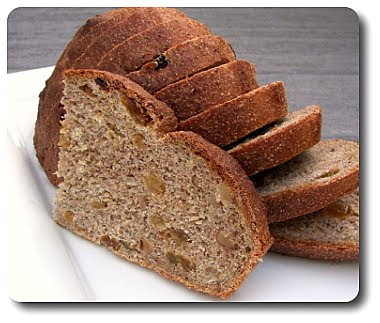 The rye flavor was there, and was bolstered by the caraway, but it wasn't as prominent as Jeff or I would have preferred - maybe up the rye and decrease the whole-wheat next time?. 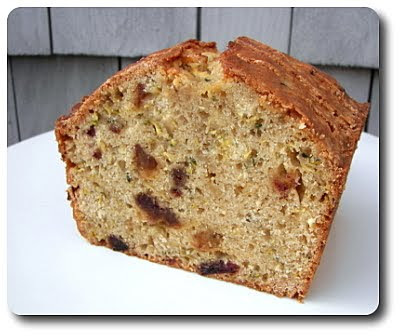 The sweetness coming from the raisins was a delightful contrast to the more savory rosemary, while the walnuts injected an engaging nutty crunch. Tasty enough by itself, but sent through the toaster made the hearty slices sing, especially with a pat of butter smoothed over the top! I can't believe we've been doing this Friday Night Pizza for a little over a year now and we're still chuggin' along with new recipes! 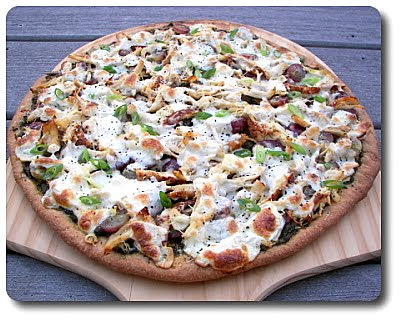 To bring this work week to a close, we went with a slightly unusual Chicken, Red Grape and Pesto Pizza. "Slightly unusual" because when one thinks of pizza, I don't think red grapes are the first ingredient that comes to mind! No surprise I'm sure, but hauling out our food processor to prepare our favorite whole-wheat pizza dough got us going tonight. And, as always, you don't have to make your own dough to enjoy homemade pizza - many local pizza shops let you buy their prepared house-made dough or you could pick up one from the market. Thinking ahead about the moisture content of the toppings, after we stretched out the dough, we went ahead and tossed it onto the pre-heated stone to partially bake through - just long enough to set the top and give the bottom a light golden hue. Instead of a red sauce, we slathered the base of the pizza in a healthy layer of thick basil pesto - I had just cut back the basil plants in the garden to zap together a batch the other day (have to get the stash in the freezer going for winter use!) and set enough aside for this pizza. I rarely make the exact same pesto, but what I tend to follow is plenty of fresh basil, toasted nuts (pine nuts, walnuts or sometimes even pepitas), a clove or two of garlic, Parmigiano-Reggiano cheese and enough oil to process. If I need a lighter pesto, I'll hold back some of the oil (usually adding at least 2 to 3 tablespoons) and make up the rest with broth. 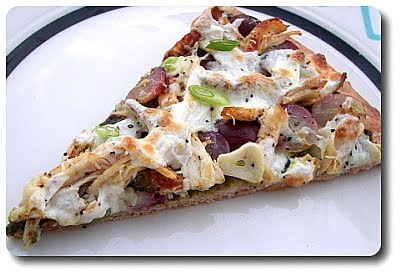 Once the pesto was on, we scattered halved red grapes over, followed by shredded cooked chicken that we had simply seasoned with salt and fresh ground black pepper beforehand. If you don't want to cook up a couple chicken breasts yourself for this, a rotisserie one from the market would work - just shred up the whole bird and save the extra in the freezer for the next time you need it. We dotted the top of the pizza with thin slices of fresh garlic and then it was finally time for cheese - fresh mozzarella and just a touch of Romano. Fresh ground black pepper was the last touch before we slid the pizza back in to finish baking. 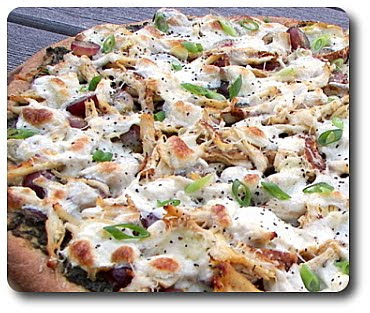 After it came out, for a mild onion-y bite, we sprinkled thinly sliced scallions over the gooey cheese just before we took our handy pizza rocker and sliced the crust into wedges. Tangy, sweet, savory and quite simply put in one word, delicious, we went a little crazy and forgot about the salad I made to go with and just settled in with way too many slices. Grapes may sound weird (though not so much to us after we made that focaccia), but it is really no different than putting pineapple on pizza... same concept with each lending their juicy, sweet and slightly tart punches. Three garlic cloves may sound like a lot to put on the pizza raw, but don't skimp - by thinly slicing it, the heat of the oven works its magic to mellow them out, calming their harshness. I think we'll up it to four or maybe five (if small) cloves next time. 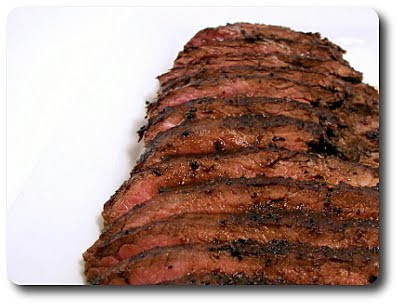 We might have made the kitchen a little smoky tonight, but it was so worth it when we sliced into this Soy-Glazed Flank Steak I made for dinner. Why the smoke? Well, when you place a juiced-up piece of meat into a fiery hot cast-iron skillet, you're bound to get a reaction! We needed to get the glaze together before we started on the steak - which was done by pacing a good dose of soy sauce, mirin (a sweet rice wine), rice vinegar, a clove of minced garlic and a healthy pinch of crushed red pepper into one of our smaller saucepans. Brought up to a rapid bubble, we turned the heat down to a simmer and let the mixture concentrate itself down until we had about half of the volume from where we started. Usually these types of steaks are dosed in a marinade, but this big 'ol hunk of steak was simply seasoned with salt and fresh ground black pepper. Making sure the heavy skillet was well heated first, we then placed the steak inside, turning it once to give each side a well-developed caramelized crust. Brushed with a portion of the glaze, we flipped the steak over to brush the naked side with the rest of the glaze, then turned it once more to finish cooking it through. 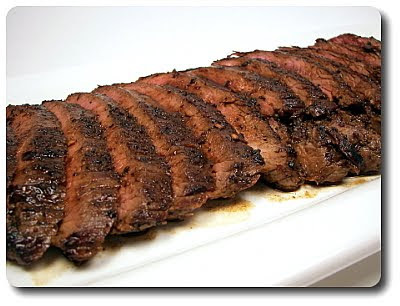 This gives you a steak that is medium-rare, perfect with this cut, but if that isn't your style, let it go to your desired degree of doneness. If you know you'll want to bring the steak to a higher internal temperature, wait to put the glaze on until the last two minutes or so to prevent it from scorching. Be sure that you give the steak at least a five minute rest before you go slicing into it, letting the juices redistribute throughout. When you are ready to divvy it up, pull at the meat a little so you can see which way the grain is running - this way you can be sure you are slicing against the grain for the best tender quality. Also try and keep the thickness of the meat in check - thinner is better, around 1/8 to 1/4" thick. 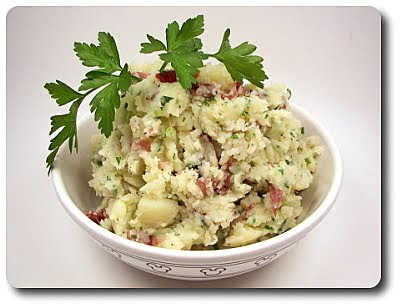 We had this, a smashed new potato side (which I need to get written up still!) and a hearty piece of crusty bread, which filled us right up, but if you're looking for a lighter dinner, serving the strips of steak over a mess of salad greens would be lovely! 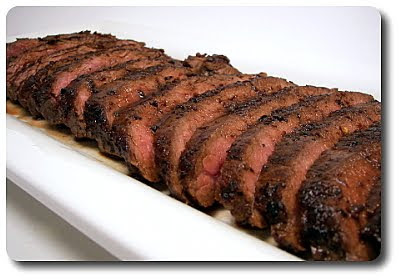 Since the steak cooks so quickly, it retains a buttery, tender texture, while the pungent glaze adds a salty, sweet bite with just enough kick from the crushed red pepper for a little burn. If you've never cooked a steak in a cast-iron skillet before, you must give this recipe a try just to see how you've been missing out - it's one magical experience. 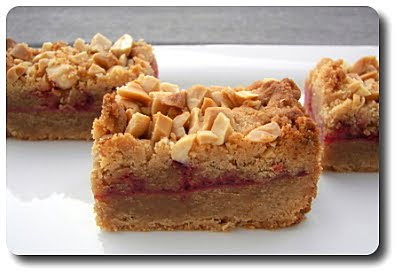 I didn't really have any rhyme or reason for picking out these Peanut Butter and Jelly Bars for this week's Wednesday Treat Day. Usually I ask Jeff for input, but he was too busy playing with Gus when I was picking out recipes for the week. 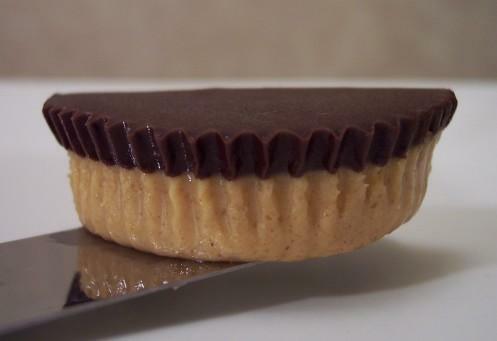 Keep in mind when you're gandering at the ingredient list that these should be cut fairly small without worry that they won't be sufficient... so, no heart attacks when you see the lavish amount of butter combined with gobs of creamy peanut butter! 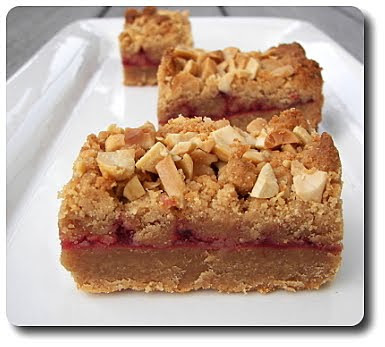 As you can imagine then, the base layer of these bars is quite decadent - the good news is the dough is a snap to prepare and quite easy to work with. Once brought together, the mixture is actually split up to be used in two ways. 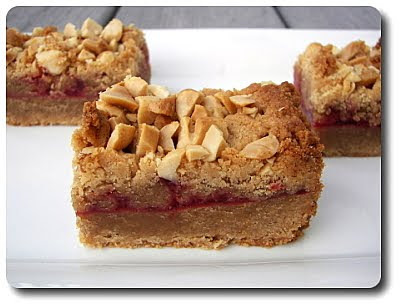 Over half of the stiff tan dough was separated out and pressed into the bottom of the baking pan - after smoothing it out, the top is anointed with your favorite type of jam. We used strawberry as we like that pairing with peanut butter (and come on, they've even made that combination into an M&M! ), but I wouldn't hesitate trying blackberry, grape or raspberry. Now that the dough was capped with that jeweled-toned topping, the rest of that indulgent dough is crumbled all over, creating lumpy nuggets of peanut butter goodness (there's that word Jeff loves to use again...). 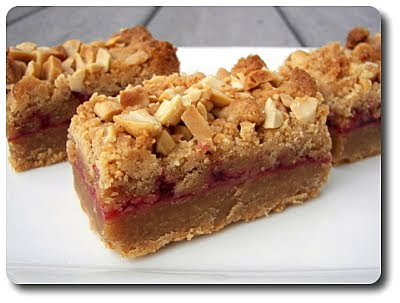 To give these bars some crunch and reinforce the nuttiness, we scattered over coarsely chopped peanuts before baking these bars off. 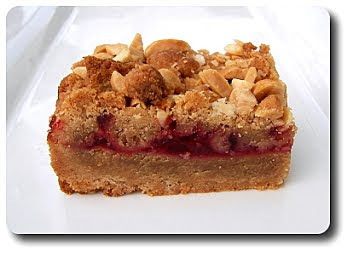 Do yourself a favor and use salted nuts - while there is plenty of salt in the bars, the nuts (and frankly the bars as well) need the boost to cut some of the sweetness and not come across as being flat on the tongue. There isn't much to do when checking for doneness of these bars - when the scent of peanut butter starts to fill the room and the top takes on a definite golden hue, they are good to pull out. After slicing the first row of bars, I noticed how they exuded the essence of richness by just their appearance of being thick, dense and frankly, like they should be illegal! Saying that, you can be sure they weren't too intense that I put away two bars in a short amount of time. I'm curious about one thing though... while I love peanut butter and jelly, I wonder how these would work if one would trade the jam for say, that groovy hazelnut spread that we all know and love as Nutella? We happened to deliver six new recipes this week and when we looked back to pick out our favorites, we tagged those Banana-Walnut Chocolate Chunk Cookies, the Roasted Tomato Pizza with Ricotta and Asiago Cheese and because they will probably be making the holiday baking list, the Lemon-Scented Ginger Almond Crisps. 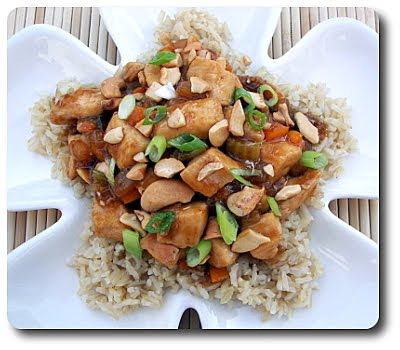 Jeff is still making remarks on the different aspects he enjoyed from this Chicken and Cashews dish we made for dinner tonight. He always gives feedback, but this time he went out of his way to make sure I knew he liked it - I guess he was just trying to subtly recommend we have this again, and soon! Although, he wasn't too happy to find out about the "special" ingredient... more on that in a bit. 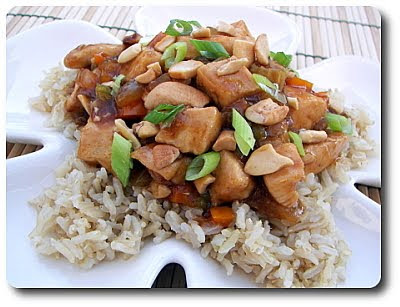 The chunky cubes of lean chicken breast called for in the recipe were coated in soy sauce and dry sherry before being tossed into a well-heated skillet to start cooking through. However, to give those two ingredients some sticking power so it clings to the chicken, they were whisked together with a spoonful of cornstarch. 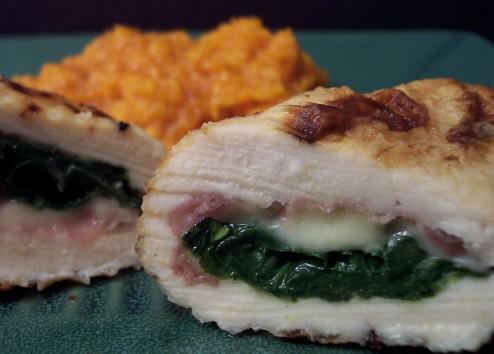 Since the chicken was sliced into bite-sized pieces, this really doesn't take but a few minutes - as you will be working in succession, be sure you have all of your prep work done and ingredients measured out so you are good to go. To keep the chicken from drying out, it's removed from the skillet, while a bit of sesame oil is drizzled in to heat up. Chopped onion, celery and colorful bell peppers are then stirred in and left just long enough to take their raw edge off. Fresh ginger and garlic, a staple around here, were the next team to join the party, followed by the almost-cooked chicken mixture, as soon as their pungent aromas were released. And don't forget, be sure to pour any and all juices that were left on the plate the chicken was stored on! It's not very saucy as of yet, but we fixed that by stirring in a combination of chicken broth spiked with soy sauce, oyster sauce, sticky honey and a touch more cornstarch. Brought to a boil to activate the cornstarch, the dish was now bubbly, ready and waiting to be served. Topped with scallions for a fresh note and roasted cashews for crunch, we scooped this over a bed of nutty brown basmati rice to serve. I did make sure to wait until Jeff was almost done to inform him of that "special" ingredient I mentioned earlier - oyster sauce! See, if he would have seen it or known about it before hand, this probably wouldn't have made it on the table tonight. He just assumes it's going to permeate the dish with an off "fishy" taste and ruin his dinner. 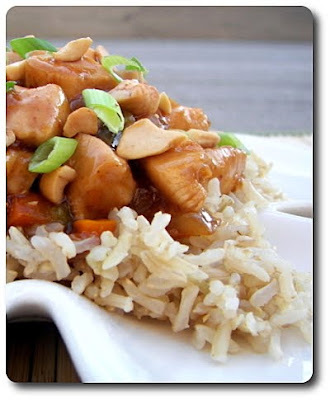 Instead, all this syrupy sauce does is add a rich, savory essence that rounds out the flavor. So, while I got an eye roll and an "ugh", he did take it back with a sigh and a clean plate! I think we may have a new addition to add to the upcoming holiday baking spree (yes, get ready, that time is coming up fast once again!). Besides the fact that these Lemon-Scented Ginger Almond Crisps passed the taste test with flying colors, this will most likely be moved to the "must make list" because the dough can be done in advance and makes a ton of cookies! What drew my attention to this recipe was how this eggless dough was prepared, a little different than your average cookie. Remember how that Cinnamon Chip Sour Cream Cake we recently made was prepared? It is somewhat similar to that - the dry ingredients, flour, sugar, pungent ground ginger, fresh lemon zest and sweet cinnamon were tossed right into the mixing bowl first and whirled around to combine. The softened butter, molasses, pure lemon extract to amplify the zest and a splash of vanilla are then beaten in - it may look a little crumbly at first, but it will come together into a firm dough. When the fragrant dough was ready, we got out our reliable wooden spoon and stirred in minced crystallized ginger and toasted sliced almonds by hand. Divided into two pieces, with each being formed into just over an inch thick brick, we wrapped up the dough and left it in the refrigerator to chill out while we headed off to the farmers' market this morning. The dough needs to firm up to be able to slice it thin enough - while it isn't sticky, if you went to try and slice it right away, it would just squish down and not come out in uniform slices. I wouldn't say that slicing the dough is tricky, but the recipe calls for getting the planks thinner than 1/8" - with the chunky bits of ginger and almond in the dough, that didn't always happen. However, the dough is malleable enough that you can press it flatter or back together if need be. When we do this for our baking spree, I'll probably slice up the solid bricks completely, then freeze the thin unbaked cookie dough - this way I'll be able to pop a pan into the oven whenever it is convenient... you know, when I'm busy with recipes that don't use the oven like fudge or toffee. You can arrange the cookies on the baking sheet fairly close together - they spread, but not much. You'll be safe if they are kept about a half inch or so apart. 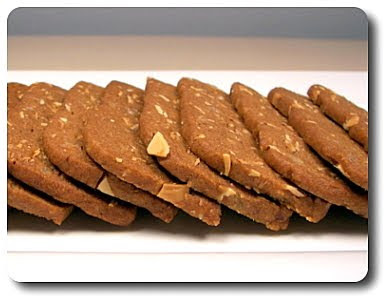 Since the dough is pretty brown already, thanks to that robust molasses, doneness is harder to spot - you are looking for the edges around the cookies to darken slightly and for the cookies to look set. They come out of the oven a little soft, but as they cool, they will firm into crispy gems with a snappy bite. Cinnamon and ginger already go well together, but throw the magic union of lemon and almond into the pot and a dynamite marriage is born. I loved how the sweet heat from the fragments of crystallized ginger weaved throughout the cookies without being too intense - just noticeable enough to stimulate and charge our taste buds. 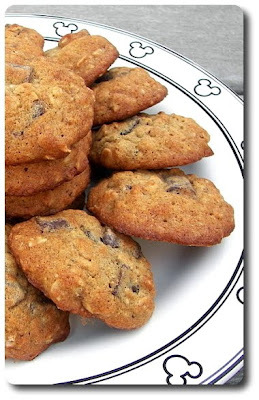 Out of the full recipe, I ended up with just about 9 dozen cookies - however, you could easily halve the ingredients if you don't need quite that many! We've had a few ripe Roma tomatoes come from our plants in the backyard, but the majority of them have stayed green for quite some time. However, within the last week and a half, they have finally started to ripen up (darn cool weather!) 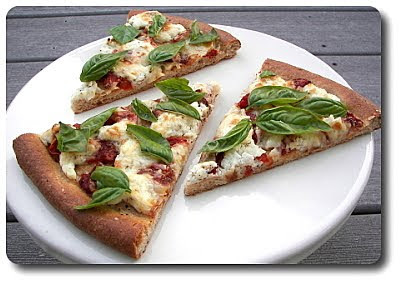 and we put three of them to good use in our Friday Night Pizza by making this Roasted Tomato Pizza with Ricotta and Asiago Cheese. Slicing the tomatoes in half, we spread them out onto a baking sheet and gave them just a whisper coating of granulated sugar to get the process going. Roasted for just about an hour, you'll know the tomatoes are ready to come out when they have started to shrink and the edges have begun to crinkle, yet they are still soft with some juiciness left in them. We're not drying tomatoes after all, we just want to concentrate that fresh summer flavor down into rich bites. I went ahead and did this yesterday because I just didn't have time tonight - if you would like to do that, roast and let them cool down, then stash them in the refrigerator. They should hold for a few days. Since the pizza was going to be fairly light with the toppings, we went ahead and used the pound version of our whole-wheat pizza dough. Stretched into a round and pre-baked, this time we did give the dough a bit of a lip for a chewy edge around the sides. Just as it came out of the oven, we brushed the dough with extra-virgin olive-oil, then started a pizza crust painting party by arranging our selection of ingredients over the top. To make sure the pizza would be evenly covered by the tomatoes, we chopped the caramelized halves into chunky bits, then scattered them over. Using a large scoop of smooth ricotta cheese, we randomly dropped small dollops on top and quickly followed each with a bit of salt and fresh ground black pepper to season. Paper thin shavings from our nutty block of Asiago cheese finished the pizza off before going back onto the stone to finish baking - Parmesan would also work well if you don't keep Asiago on hand. Since the bottom of the base was already lightly browned from the pre-baking, the pizza just took a few minutes to melt the cheese and finish crisping up the crust. If you do like a softer crust, you will probably want to skip the first bake and just top the raw dough - we just like us some crunch. 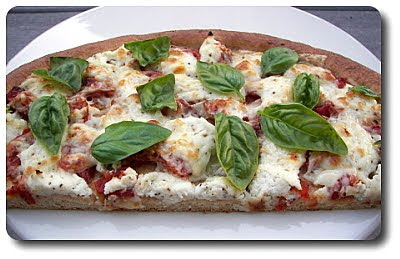 After I reached the peel in to grab the pizza, we had one more topping to add before we dug in - torn fresh basil leaves! Adding simple slices of tomatoes on pizza is nothing out of the norm for us, but taking the extra step of roasting the thick, meaty Romas added such a complex depth that heightened their sweetness and made it worth waiting for the tomatoes to finish ripening. 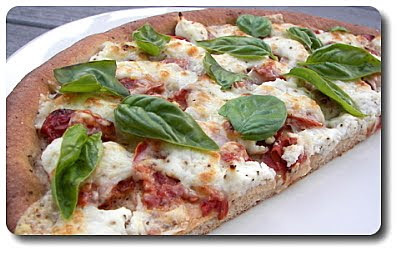 One of our favorite pizzas yet! As a side for tonight's dinner (which happened to be leftovers), I prepared this Parsley Smashed New Potatoes since we picked up a pack of baby reds at the farmers' market. I didn't actually know what I was going to do with them, but seeing as how they looked freshly dug, I knew we would find a way to work them in! Certainly any smaller red potato would be fine if you don't have access to the creamier baby ones - however, I do think they are worth seeking out, especially if you've never tried them fresh from the garden! Instead of boiling these beauties, we tossed them whole into one of our steamer baskets and set them on top of a pot of boiling water. Do try and ensure the potatoes are roughly the same size - if any of them are larger than 2", it is worth halving or quartering them so they all cook at the same time. If your pot won't hold much water with the basket, don't forget to keep an eye on the water level - if it looks like it is getting low, you'll want to add more hot water so the pot doesn't go dry... speaking from experience! I had that happen once while we were cooking tamales - since they usually take quite a while to cook, I completely forgot about it. Oops! One ruined pot that I'll never live down - hee hee! While those were off working, we got the add-ins together - thick, Greek-style yogurt (though I imagine any plain yogurt you can get your hands on would be fine), sliced scallions, parsley, a couple knobs of butter and of course, salt and fresh ground black pepper. As the potatoes are so tender already, we didn't even bother with a mixer or potato masher to have at them - all it took was a fork to coarsely break them up and combine with the creamy yogurt mixture. Besides adding a wonderful tang like one would get from buttermilk, the yogurt added a decadent body to the potatoes without the need for too much butter - it uses just enough for flavor. With being steamed, the potatoes didn't have the luxury of being cooked in seasoned water, so don't be too shy with the salt - absolutely taste as you go, but potatoes love salt to make them pop. 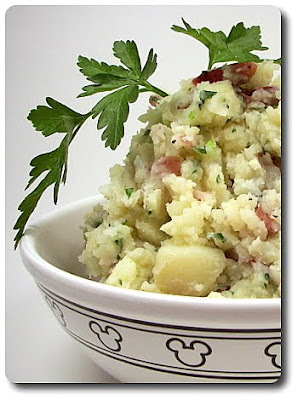 With it's short ingredient list, these smashed potatoes had plenty of texture going on and were quite light with a snappy zip - one satisfying side dish for sure! Cookies! That's what Jeff responded with when I asked him about this week's Wednesday Treat Day. So, cookies it was - but what kind? After noticing the sad, but very sweet and ripe, banana sitting on the counter, we decided to put it to good use in these Banana-Walnut Chocolate Chunk Cookies.With a light and creamy base consisting of butter, granulated sugar, brown sugar (light or dark, your choice) and an egg, we infused a sweet fragrance into the dough by mixing in a couple splashes of vanilla - I'm partial to Madagascar bourbon. The banana, which I mashed fairly smooth, was then mixed in to combine. All-purpose and whole-wheat flour, mixed with salt and baking soda, was incorporated in, followed by a scoop of old-fashioned rolled oats, chunky bits of bittersweet chocolate and coarsely chopped walnuts, which we of course toasted first (a must!). 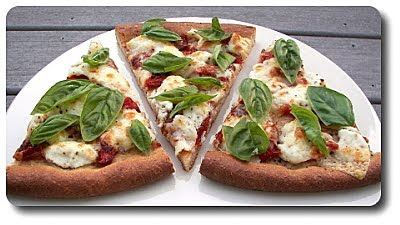 Using the mixer to blend the flours in is fine, but use a sturdy wooden spoon for the rest as to not overwork the dough. Since this was an all-butter dough, I thought about refrigerating it first to control spread, but I sent a couple test cookies in to see. 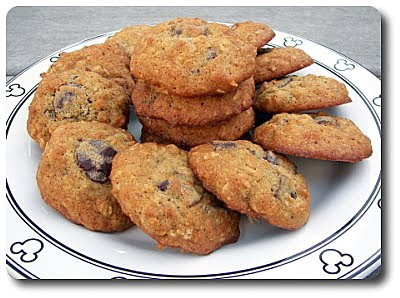 They spread out just enough, but not near as much as I thought they would... so I was able to bake them off right away! Baked until the cookies were golden and set, let them cool on the baking sheet for a few minutes before sliding them off to finish cooling. Puffy and tender, these rounds were pretty thick with each being graced with plenty of chocolate and nuts. Since the majority of the flour is all-purpose, you don't have to worry about the whole-wheat weighing them down or making them dry - what it does is add an inviting wholesome quality. Because the banana brings a fair amount of moisture into play, the cookies won't be crispy - however, with the heartiness of the rolled oats tossed in, they had a nice chew to them. 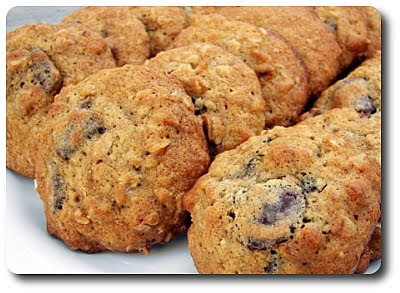 While I wouldn't necessarily put them in the category of being muffin or cake-like, they are definitely a softer style of cookie with flavors reminiscent of banana bread spiked with chocolate. Cinnamon might haven been a complimentary spice to throw in for warmth - I did automatically grab the jar when I was gathering the ingredients and was going to add, but held back and waited to try one of the test cookies. I'm glad I waited as I thought this combination was dynamite as is and left well enough alone!